Blizzard's MOBA is finally paying homage to Warcraft. Blizzard's MOBA Heroes of the Storm was first launched back in 2015, bringing us a greatest hits package of sorts featuring characters from all over Blizzard's portfolio, from the recent success of Overwatch to the sci-fi battles of StarCraft, but something that has always been missing is Warcraft. Not anymore though, as Blizzard has revealed Echoes of Alterac, which will bring with it swathes of new content based on the classic universe, and we were privy to a private presentation about the content. Here's a taste of what's coming. A big part of this new content drop is Alterac Pass, a brand new three-lane battleground with Warcraft-inspired elements, from the minions to the keeps; the perfect setting for the Alliance to face the Horde. There's a twist though in the added mechanic, as each team has a goal to break their cavalry out of a cage guarded by the enemy team, at the same time preventing your opponents from doing the same, meaning there's a constant balance between attack and defence, especially since you need to hold these cages for a set amount of time too. The Cavalry cages as they appear in-game. After one team is successful in holding the cage for the set time, the event is won and we move onto the next stage. After a short delay, the winner spawns three cavalry units and these boost movement speed and damage to nearby allies, similar to the Tomb of the Spider Queen in that they'll push down each of the three lanes. They're not too effective pushing on their own, however, so it's all about using them alongside the team. The Cavalry unit, and the aura around them. The Cores are slightly different this time around too, as these are replaced by iconic Alterac Valley generals: Drek'Thar on the Horde side, and Vanndar Stormpike of the Alliance. These still form the win condition, but they are their own characters, having an area-of-effect attack to clear out minion waves as well as being able to move around and regenerate health when not in combat, stuff that should all feel familiar if you've played in Alterac Valley in Warcraft. Catapults won't be spawned on Alterac Pass either, as the team explained the moving generals would just be able to smash them, so instead on the Keeps you'll spawn a tanky melee Reaver minion. These have a lot of health and lead the minion assault, soaking up the general's damage and letting the rest of the minions do damage to them. Keeps also provide generals with 20 armour each this time around, placing a heavy emphasis on destroying them. It's also important to mention that Alterac Pass is a double boss map too, featuring Mountain Giants neutrally placed and pushing down the top and bottom lanes, similar to Cursed Hollow. These have similar abilities to the usual Nexus Grave Golems, meaning they have the standard AOE stomp attack, and in terms of design, they were visually tailored to suit the Warcraft and Alterac theme as well, as you can see below. A Mountain Giant, surrounded by players. "There's obviously a lot of cool places we could've explored in the Warcraft universe," explained Matt Cooper, lead content designer. 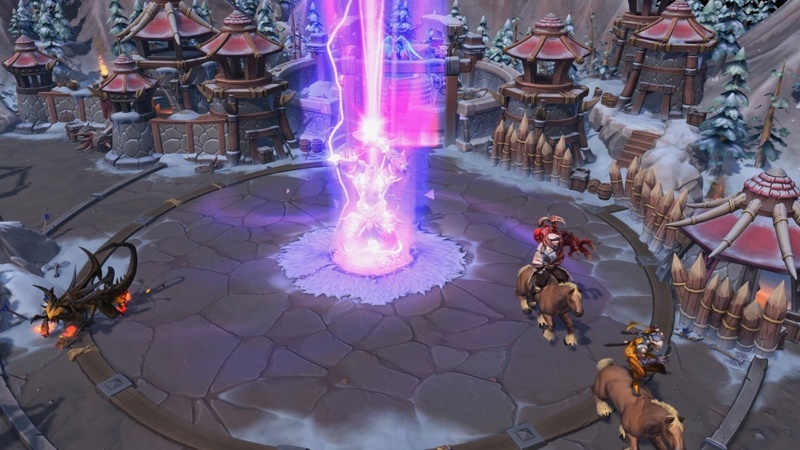 "For us Alterac Pass, one element of it was that snow visual, that snow theme that is very distinct and we don't have anything like that in the Nexus yet. I think Alterac Valley is definitely very iconic, those 40v40 truly represents the Horde vs Alliance conflict and there's a lot of really fun moments on that battleground. The generals, the graveyards - these were all kind of mechanics we really wanted to explore in Heroes because I think we have a lot of fun memories with that." Along with this new battleground is also a brand new hero: Yrel. If you've ever played World of Warcraft: Warlords of Draenor she'll be familiar to you, but if not, she's a draenei paladin who's a key hero for your people. In Heroes of the Storm she's a tank character with good crowd control, and she also has good sustain, meaning she can keep herself alive and in the fight. On the other hand, she's weak to enemy crowd control and doesn't deal well with highly mobile enemies either. 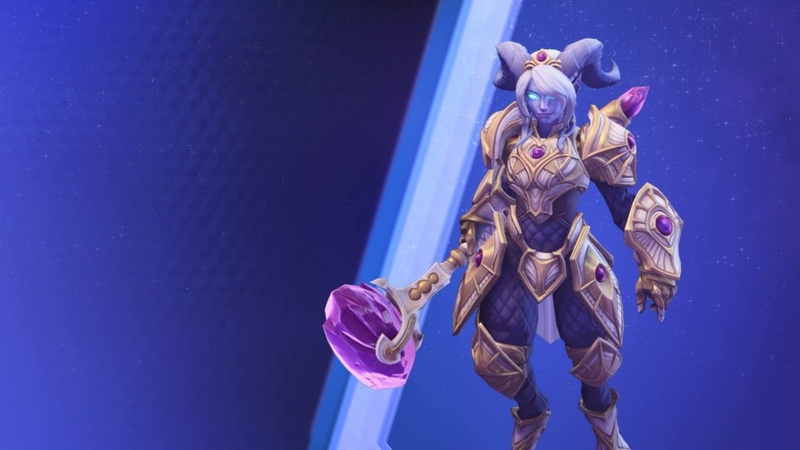 A closer look at Yrel in Heroes of the Storm. In short, she's a hefty melee warrior who rewards deliberate commitment from the player, and who also can charge up all of her abilities. The twist here is that you don't have to hold the charge until the end as players can press the button again at any point during the charge to initiate the ability, varying the power. There's a UI indicator for this charge too, as well as an in-game animation, and you can hold this full charge indefinitely (although it will make you move slower and can be interrupted by stun and silence effects). Onto her actual abilities, and on Q we have Vindication, which unleashes holy energy to heal Yrel and damage enemies, with the charging able to increase the effectiveness and range. On W, however, you have Righteous Hammer, allowing you to damage enemies and knock them away, and charging this not only increases damage and knockback distance but also stuns enemies if they're hit with a fully-charged attack. Vindication can be seen in action on the left, with Righteous Hammer on the right. The third basic ability is Avenging Wrath on E, allowing you to leap to an enemy's location to damage them and slow nearby foes, with the charge increasing the range but not the efficiency of the effect. This is useful not only for attacking but also escaping certain dangerous situations, as you can imagine. As for Yrel's trait, this is called Divine Purpose, and once activated this lets her next basic ability get used instantly at maximum charge, ideal for reacting quickly and stringing together powerful combos in important situations. Her first heroic ability is Ardent Defender on R, which not only prevents all incoming damage for a short time period but also heals for a portion of the damage prevented, working a lot like Protected. This time, however, Blizzard are displaying an 'Absorbing' status effect, since the effect is way more powerful. Divine Purpose in action on the battlefield. The second heroic ability is called Sacred Ground, sanctifying the ground around her and granting her a huge armour boost which lasts until she leaves or is pushed out of that area, without a time limit. Blizzard told us that this would be especially useful when pushing a keep, for example, as you'll need to be in that one place for a long time, and this will give you a strong base to attack from. The area that Sacred Ground affects. "So there's a few cool things we get from going with Yrel," lead hero designer Matt Villers told us. "Obviously we didn't want to get Adrenna of course, that's really important, but she's also a really cool character from a recent Warcraft expansion, right. She really featured there. She also hits this retribution, paladin fantasy we don't have yet really [...] she's also got this very unique look compared to other characters in our game and it's also an opportunity to do this character who's very serious, but also has a bit of light-heartedness in there. She's got these really cool, bouncy animations, and it just felt like a really fun character and a really good fit." If you're a regular Heroes of the Storm player you'll know of events called Quests that allow you to gain rewards for completing challenges, and just like in recent events where there are branching storylines, choice will be important in the new Echoes of Alterac event too, where you have to choose between the Horde or the Alliance. This choice will be the first step, and then the first stage of the event itself will challenge you with playing four games as a Warcraft hero (at which point you'll get a chest that unlocks a random hero for you). A new portrait will then be on offer for achieving 50 takedowns in winning games before you can earn a new banner by playing six games with friends. The last stage has the biggest reward though, as you can earn a mount by winning eight games as a Warcraft hero. There are also new skins as part of the event, meaning that existing characters are translated into either Horde or Alliance variants, the most entertaining of which is Junkrat being turned green as part of his Horde skin. That's not all though, as there are upgradeable mounts, as well as of course sprays too. The two portraits you can earn in the Echoes of Alterac event.